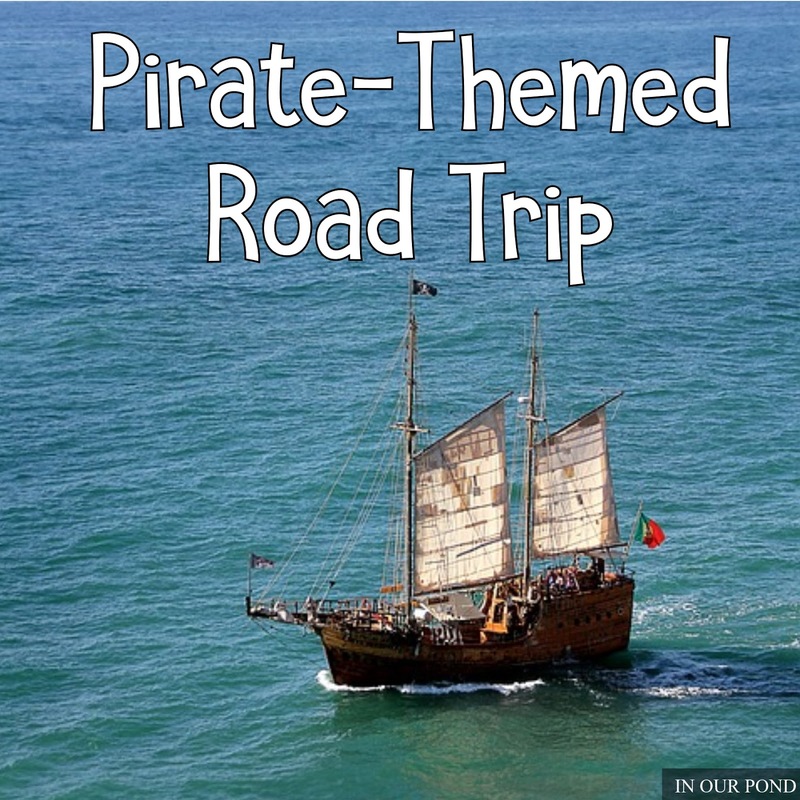 This pirate road trip was the longest trip our family has ever taken. It was intense! 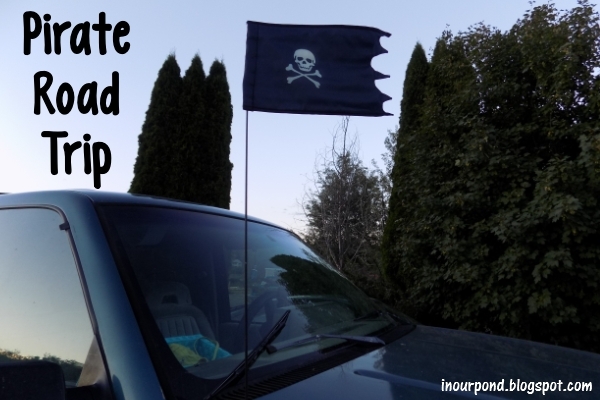 Eight days of driving, seven states, and six hotel rooms! We did a little of everything on this trip, and saw both sides of the family. Like most road trip families, we had a lot to pack. The majority of our clothes were in a large, plastic tote with a lid, which worked well for us. We packed enough for two days (our hotel stays) in a small, carry-on suitcase. Our family toiletries were in two toiletry bags- one for first-aid/meds and one for soaps/toiletries (which fit in the carry-on. Then, we also had a large bin of kids' toys/activities, a smaller bin for the hotel kitchen, and a bin of snack. Since some of my kids are potty trained and some aren't, we had a backpack of diapers and a bin with the travel potty. As part of my road trip preparations, I sewed colored elastic into "clothes scrunchies," which we used to hold the bundles of kids' clothes wrapped tight. Each bundle had shorts, shirt, and diaper/unders, all contained in a roll and secured with the scrunchie. I loved that the clothes didn't become unrolled when we tossed them around in the suitcase. They were also easy to grab and easy to differentiate. Anyone could help me get the kids ready, because everything they needed was bundled together. Plus, they're not as slippery and bulky as plastic bags. 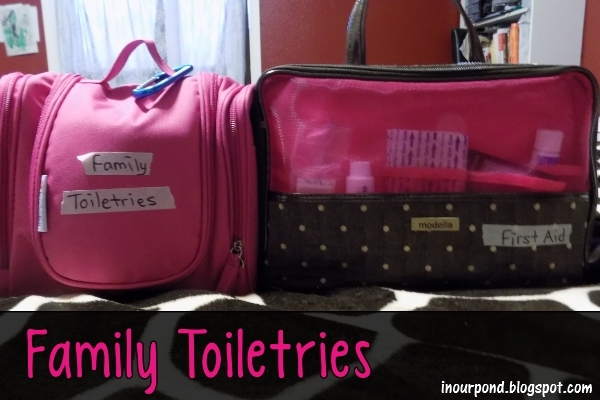 I have to brag about the toiletry bag on the left. It has four 8-oz bottles of soap/shampoo, five toothbrushes, two toothpastes, deodorant, hair products, and a pile of small things (bandaids, nail clipper, tweezers, etc). The best part is that it was less than $10 on Amazon! 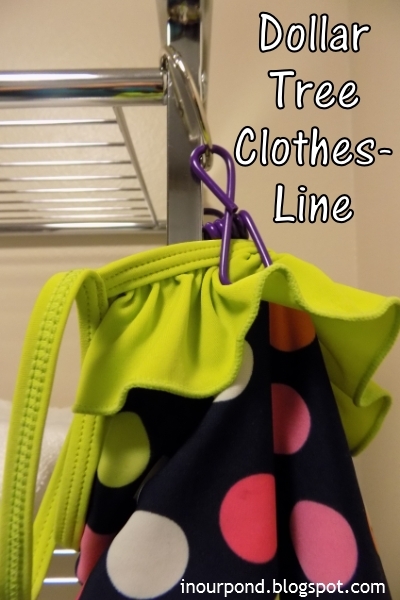 As a family of five, we had a lot of swimsuits to dry after a family swimming time and these dollar tree hooks that I made were very handy. I used book rings and a clip (both found in the office supplies section). The ring opens up to hold the clip and to wrap around a shower curtain ring or towel bar. 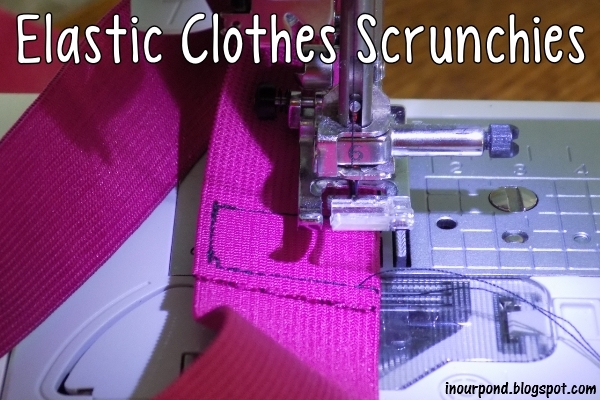 The clip grabs onto the swimsuit. It's such a simple thing but very helpful. In our eleven day road trip, we spent six nights in a hotel. At every hotel, I (the mom) went into the lobby to check us in and get the keys. 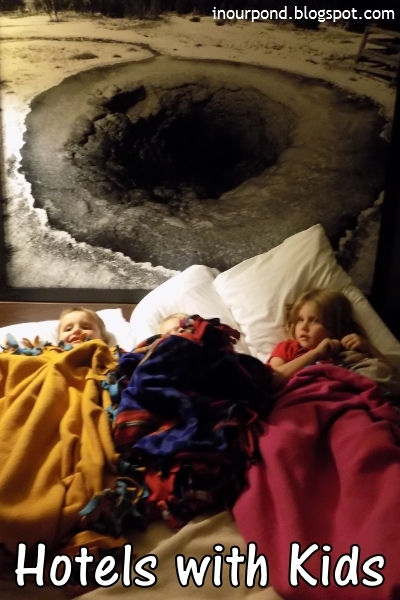 Then, my husband would bring the kids, who carried their own blankets and toys, into the hotel room. I would stay with the kids in the room, while my husband carried in the things we needed that night. Depending on the lateness of the night, the kids would spend some time jumping on the bed, before settling in to some TV time snuggles with mom and dad. At bedtime, we put two kids in the one bed and one on the floor. They used their own blankets and the hotel's pillows. Once everyone was settled down, I played some read-aloud books from Youtube for about a half hour. Everyone slept pretty well in the hotels. In the morning, we had the opposite routine as the night before. The kids would watch a bit of TV while my husband loaded the car. Then, everyone would sit in the car while I checked us out of the hotel. On some mornings, we would eat breakfast at the hotel. Other days, we would eat in the car. We almost always stopped for coffee and gas at the station. Then, we were on our way! Eight of our our eleven days vacation were spent driving. We have an early 90's SUV, which seats nine but we only have three kids. We spaced the kids out to give them lots of room and to put them away from doors and windows that could open. 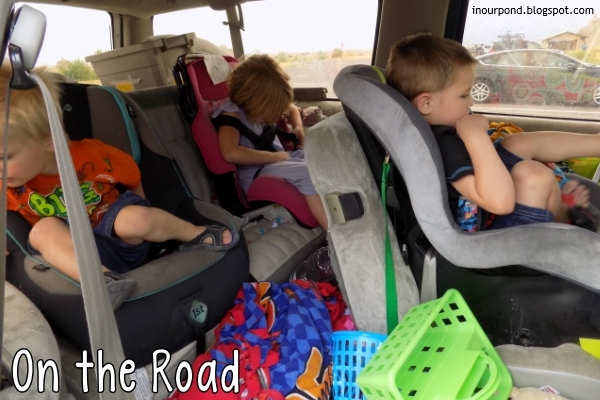 We folded down the jump seat which gave us a raised place for diaper changes, the travel potty, and clothing changes. As you can see from the picture, the kids had their blankets and water bottles with them at all times. No one was buckled in this picture but this is not how we drove the car. The car is parked in this picture. I had brought a huge tub of activities with us, but the kids only used about a third of them. Dragonfly really enjoyed the rainbow scratch postcards that we brought. Skimmer enjoyed his Dusty Crophopper miniature airplane (and seeing real crop-dusters on our trip). And Tadpole enjoyed the rainstick and matchbox cars. 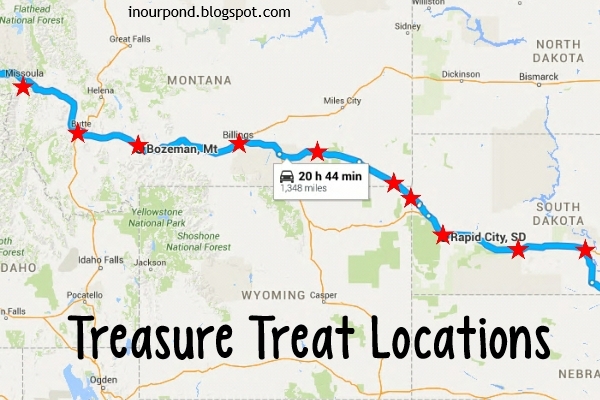 One of our best assets on the road trip was my kid-friendly map that I made. The stars are large cities, significant moments on our drive (like highway changes), borders between states, or some place random. I marked our progress with tiny stickers, which helped all of us to see that the journey was moving forward, that mommy and daddy knew where we were going, and that the trip had an end. We also used the map to review geography and to review what had happened on the trip in each place. One day of our trip was a last minute detour, and the kids got very anxious that we didn't have a map for it. I think this will be a featured part of every road trip for several years. The purpose of all that driving was to see both sides of the family. 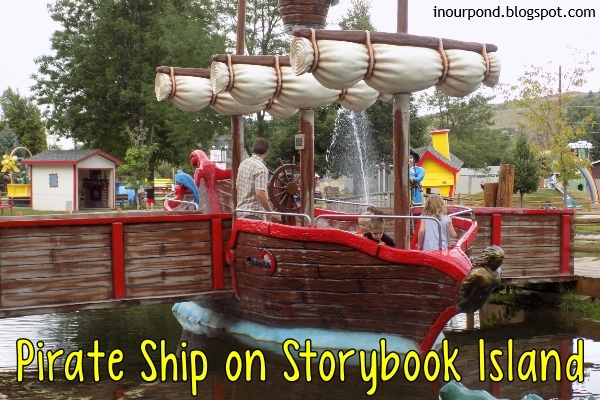 We spent a few days with my husband's family. The "children" hadn't all been together in ten years. 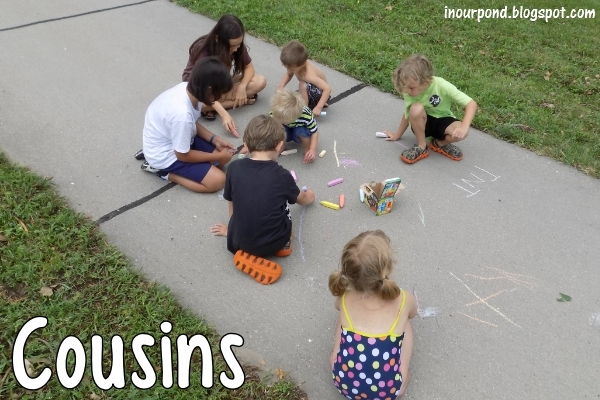 The cousins had never been together. We were only together for 2.5 days, which was too short, especially for the cousins. By the time they had settled in to being together, we had to leave. Next time (maybe next year), they'll be ready. We had planned to have the family reunion at a retreat center, which had a bunch of activities and a good place for us to hang out. Something happened and someone in the family ended up in the hospital a few days before we were all supposed to arrive on location. All the plan had to change. My BIL and SIL's church was amazing to us, hosting us in their homes and giving us places to have our meals. The hospital was so hospitable, also. They gave us snacks and drinks out of the floor fridge, let us use a "lounge" room on the floor to spend time together, and tolerated all of our comings and goings very graciously. It ended up being a perfect weekend after all. 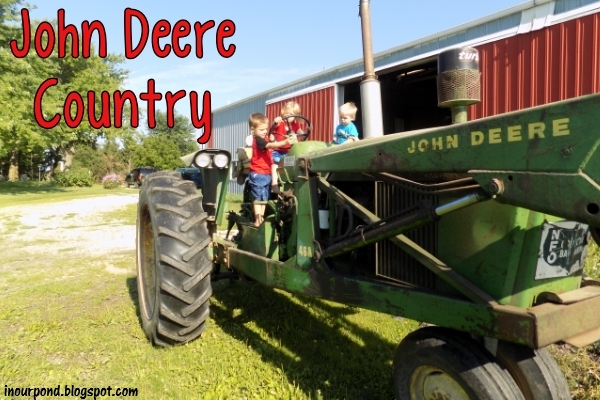 Next, we continued further into John Deere Country to see my grandparents, whom I hadn't seen in five years. My kids had never met them, and my husband had never been to their farm. We were only able to spend one day together, but it was a very special day. You can read about our trip to the dinosaur museum here. And all the fun we had around Rapid City here. We have more touristy things on our list for next time. I have one more Travel Time Tuesday post before the summer officially ends. I hope you've enjoyed this series. I enjoyed writing it. Remember that you can find all my TTT posts by clicking the link at the top of the blog or by selecting the post tag.